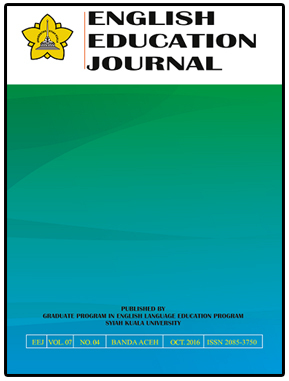 EEJ (English Education Journal) is a peer-reviewed and open access academic journal published by the Graduate Program of English Language Education, University of Syiah Kuala, Banda Aceh, Indonesia. It presents the work/research of students and lecturers who are in the program. It is published four times a year in the months of January, April, July and October. The articles are those in the scopes of English language teaching and learning, linguistics, and literature. The contents include analysis, studies, research reports, material developments, and application of theories and reviews. EEJ invites articles that have never been published or being considered elsewhere. Please thoroughly follow the submission guidelines for article contributors, and to submit an article please use your username and password after you register using the OJS (Online Journal System).